1. Grace Kelly’s gown, designed by MGM Studios costume designer, Helen Rose, took 36 seamstresses six weeks to make. 2. 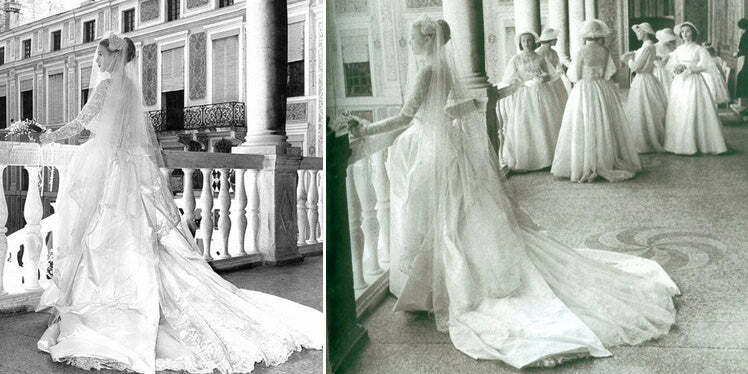 Prince Rainier allowed MGM to film the entire wedding in exchange for ending Grace Kelly’s seven-year movie contract. 30 million people watched the wedding on TV around the world. 3. Kelly’s family had to pay a $2 million dowry to the royal family in Monaco to allow the wedding to go ahead. 4. There were two ‘weddings’ – a civil ceremony on 18th April 1956 and a religious ceremony on 19th April. 600 guests attended the religious ceremony. 5. For her civil ceremony, Grace Kelly wore a pale pink taffeta dress, covered by cream Alencon lace. 6. After the civil ceremony, the couple held a reception and invited all the citizens of Monaco to attend so that they could shake hands with the new Princess. 7. 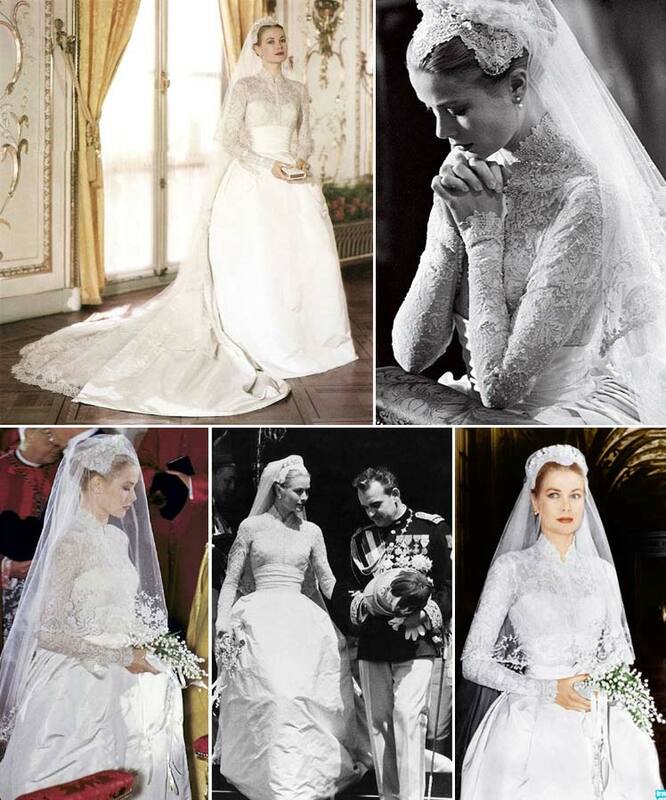 Kelly’s famous wedding dress was made from 25 yards of silk taffeta, 100 yards of silk net and 125 year-old Brussels lace not to mention 800,000 sequins and 1,500 pearls and rhinestones. 8. 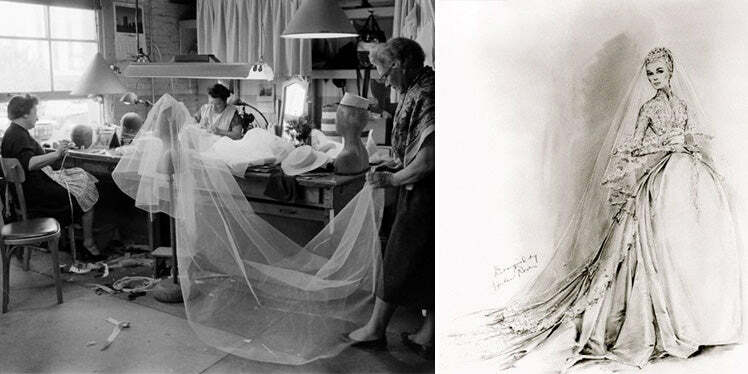 Grace Kelly also wore a Juliet cap decorated with seed pearls, orange blossom and a tulle veil, 90 yards in length. 9. She carried a bouquet of lily-of-the-valley and a copy of Rev. J.M. Lelen’s Bride’s Manual: A Manual of Catholic Devotion with Mass for the Marriage Ceremony and the Nuptial Blessing. The book was a gift from a family friend of the Kelly’s and the cover was studded with pearls. 10. The six-tier wedding cake was iced in pure white, to flatter Kelly’s delicately coloured dress. It was a gift from the chefs of Monte Carlo’s Hotel de Paris. 11. When the couple cut into the cake with Prince Rainier’s sword, a pair of turtledoves were released from the built in cage in the top two tiers. 12. Six adult bridesmaids wearing yellow silk organdy over a yellow silk taffeta underdress accompanied Grace Kelly. One of the bridesmaids wrote a book about her experiences at the ‘wedding of the century’. 13. The House of Creed was commissioned to create a perfume, Fleurissimo, especially for the wedding. Other female icons including Jackie Kennedy and Madonna have since worn it. 14. There were rumours at the time that Grace Kelly wore flat shoes for her wedding so as not to appear taller than her husband, In fact she wore shoes with a two-and-a-half inch heel and one shoe had a copper penny built into the sole for luck. 15. Queen Elizabeth II reportedly refused to attend the wedding because there were ‘too many movie stars’. 1500 reporters came to Monaco for the wedding, more than covered the whole of World War II and eventually, Prince Rainier had to call in the French riot police.